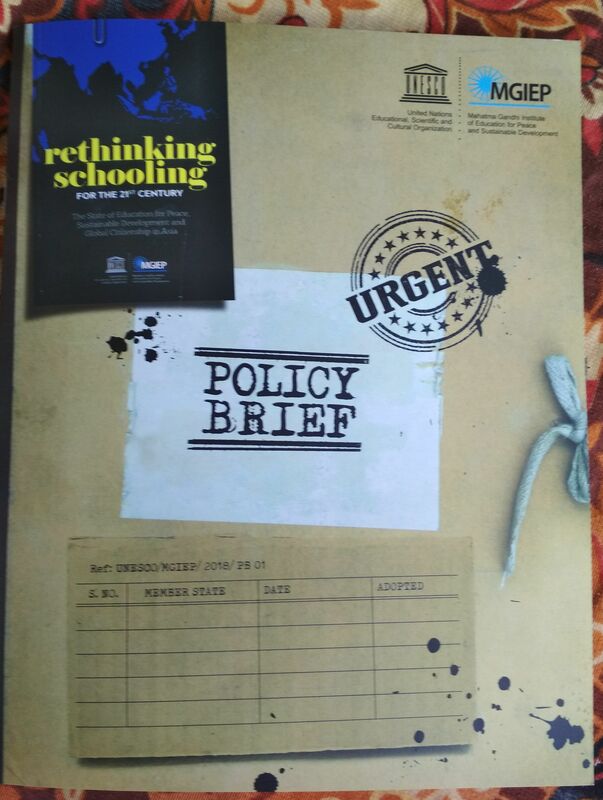 In a follow up to its SDG 4.7 review report, ‘rethinking schooling’ published in November 2017, Delhi situated UNESCO MGIEP (Mahatma Gandhi Institute of Education for Peace and Sustainable Development) on October 16 released a policy brief on the same. 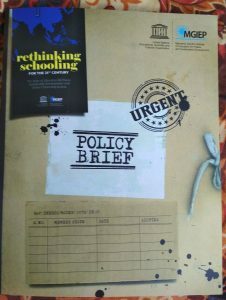 The policy brief calls for a rethink on the fundamental priorities of education policy, creating platform for bringing together expertise in child-centric and curriculum design in core subjects at primary and secondary level, promoting participatory model of curriculum development and reassessing international emphasis on monitoring and measuring educational outcomes. UNESCO MGIEP in partnership with UNESCO’s Asia and Pacific Regional Bureau for Education (UNESCO Bangkok) and field offices in the region, in 2016 had launched a project to review the extent to which concepts and competencies associated with SDG 4.7 (which is target for to ensure all learners acquire knowledge and skills needed to promote sustainable development including promotion of a culture of peace and non-violence) are mainstreamed in education policies and curricula in 22 countries across Asia (China, Japan, South Korea, Cambodia, Indonesia, Lao PDR, Malaysia, Philippines, Thailand, Vietnam, Afghanistan, Bangladesh, Pakistan, Bhutan, India, Nepal, Iran, Sri Lanka, Kazakhstan, Kyrgyzstan, Mongolia, Uzbekistan) . This report provided a dismal state of education for peace, sustainable development and global citizenship in the countries of study. Across much of Asia, neither the reality of schooling nor the patterns of development with which it is associated give cause for blithe optimism. The report was written by a core drafting group consisting of Krishna Kumar (as chair), Former Director, National Council of Educational Research and Training (NCERT), India; Edward Vickers, Professor of Comparative Education, Kyushu University, Japan; and Yoko Mochizuki of UNESCO MGIEP. 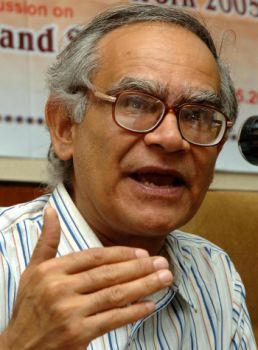 According to Prof Krishna Kumar, who gave an introductory talk before the launch of policy brief in New Delhi on Oct 16; the schooling has lost its narrative, “We are living in an unsustainable world. We know the kind of life, nature and resources we enjoyed in our childhood and now won’t be available to future generations and yet we don’t dare to tell this to our children in schools.” Adding that in all 22 countries of study schooling followed almost a similar pattern of regimentalization of child minds, fostering supposedly proud national identities, and heightening the importance of competitive national economic development, he said the critique of economic development that was there in 1970s and 80s has evaporated when development came back with big bang. For a child education is just a joyless, stressful and highly competitive regiment. It can be traumatic in later life and disastrous for both sustainability and peace. “Global citizenship which should have been for the cause of humanity, importance of human concerns across the world, sharing pain and joy is also seen in terms of economic competiveness and honing competencies for the so called knowledge economy,” he said. The policy brief observes that emphasis is on preparing children for competitive participation in the global economy, rather than in empowering them to critically and responsibly engage with the world. The purpose of education is narrowly conceived in economic and instrumentalist terms, rather than ensure sustainable, flourishing societies. “The spread of examination-preparatory ‘shadow education’ has fueled completion with serious implications for equity and the quality of education,” the report has found. Also, the explicitly and positive embrace of regional and transnational identities in curricula is strikingly absent. Across all 22 countries and among more than 80 sub-categories included in the coding scheme, ‘nation as privileged referent of identity’ was found to be the most prevalent concept, with the normalized weightage score of 85 (out of 100). Making a sharp contrast, ‘humanity as privileged referent of identity’ scored 31. Prof Kumar emphasized the notion of exploration, reflection, sharing and caring by children, which can be achieved if child is allowed the joy of intellectual inquiry and finding the truth of his surroundings. He said the education system has ceased to be self-aware and schools are indulging in cut throat competition where teacher has lost professional autonomy and self-esteem. Saying that circulation of ideas is a challenge, he cited the case of secondary education commission in 1950s, which talked many things that are being talked nowadays in case of our country. Prof Geshe Ngawang Samten, vice chancellor of Central University of Tibetan Studies, Sarnath, Varanasi, who was a panelist at the event, said that we need to redefine the goal of life and if it is happiness then the whole system must transform accordingly. “We need to look beyond material world and see where is the best pleasure, contentment, love, wisdom and other virtues. We have skill to regulate our emotions,” he added. Attacking the wisdom of placing important goals like sustainable development and peace subservient to a goal and not making these major goals in themselves, Prof Muchkund Dubey, former foreign secretary and president of Council for Social Development, New Delhi said that it is the UN system and entities like World Bank which have shifted the emphasis in world order to instrumentalism and making of people for market. According to the policy brief, designing curricula conducive to achieving SDG 4.7 requires not just technical adjustments at the periphery of the existing education system but a far-reaching reassessment of the nature and core purposes of schooling. For sustainable development to become a reality, policy makers are encouraged to uphold target 4.7 as the key to the implementation of SDG 4 on education and also for the other 16 SDGs. And that must be taken in the right earnest without delay if humanity is to be protected from looming disasters both natural (climatic) and manmade. Across much of Asia, neither the reality of schooling nor the patterns of development with which it is associated give cause for blithe optimism. UNESCO has championed a humanistic vision of education and is today encapsulated in SDG 4.7. These ideals need to be strongly restated and defended in an era when educational debate has come to be frame by narrowly economic and instrumentalist agenda.